Your solar power battery can soak up a lot of charge, and the sun’s rays will recharge it over time to full capacity. However, there is a risk that the sunlight will actually overcharge the battery, causing damage to it and creating all sorts of problems for you. That’s why it is important to get a decent solar charge controller to regulate the battery charging and prevent your system from burning out. 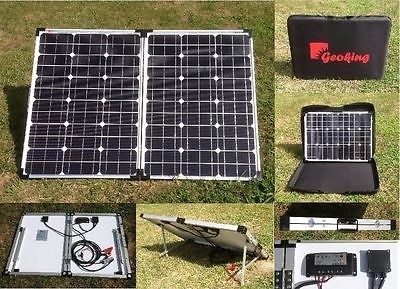 Not everyone needs a solar charge control- According to Northern Arizona Wind & Sun, some solar systems won’t need the controller, and in some environments, this extra piece of equipment is unnecessary. Know your area- If you know how much sunshine your solar panels are getting and how much power they are absorbing, then you will have a pretty good idea of whether you need a controller and what kind controller will be necessary. If there is only a little extra energy you need to account for, then you probably don’t need a very expensive or high-quality controller. Something simple and cheap may do just fine. Read the reviews- We have reviewed 10 controllers for you, but it is important to read what other customers are saying about the controllers and how well they work. That should give you some idea of how they will work for you and if you should be choosing one or the other. 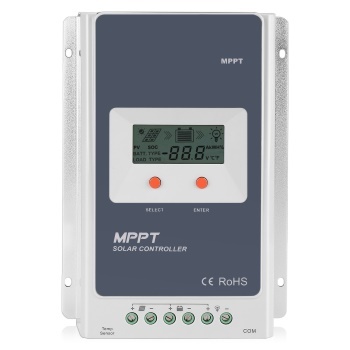 It’s time to look at some solar charge controllers and examine what makes a decent controller. This way you will be able to compare the different products, in order to make an informed choice for yourself. This is considered one of the highest quality charge controllers out there. The brand name is well respected among consumers, and you always know you are getting a quality product with Morningstar. It comes with multiple voltage controls, so you can plan to protect against different voltages. However, it can only be programmed to deal with one kind of voltage issue at a time, so you need to know what to watch for and how to set up the system properly before you implement this charge controller. This controller has been rated as one of the very best by SurvivalRenewableEnergy.com. It is a high capacity controller for a high capacity system. You would use something like this if you are trying to generate power for a couple of buildings or for a business. It’s definitely on the expensive side, but you are paying for a quality product that won’t break down on you easily and that can handle a lot of charge without allowing your battery to overcharge or your system to overheat. 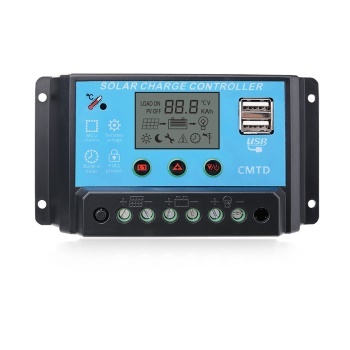 One of the best features of this solar charge controller is that it provides several different protective measures to keep your system from overcharging. It comes with both short-circuit and over-charge protection as well as inverse connection protection. No matter what happens to your solar power system, the battery and your larger electrical system should be kept safe. 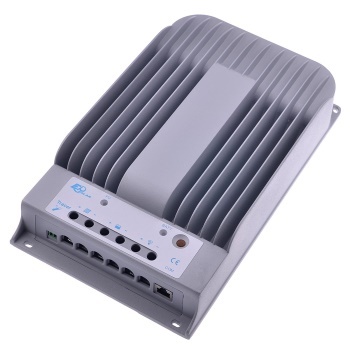 This is an ideal charge controller to use just about anywhere because it can protect you well. It also produces very little heat, protecting the battery from overheating, which is a common problem with solar charge batteries. The included battery prevents untimely discharge and meters the discharge in such a way so as to protect the battery and your system. However, because this controller performs that many functions, it can become overworked itself and stop functioning after a while. Some customers have reported it dying on them in matter of months or even weeks. 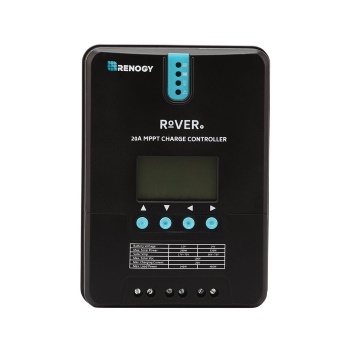 If you want a charge controller that will last you for along time, then this one from Renogy is one of your best options This brand of charge controllers tends to be among the most highly rated, and you can usually count on them for high quality products and charge controllers that work for a long time to come. The battery life on this is superb, and it is meant to stay in top condition for years. This is also a high capacity solar charge controller, so no matter what you throw at it and no matter how big your solar power system is, it should be able to handle it. Just know that you will pay a lot for the privilege of having such a reliable, long-lasting and high performing controller. This charge controller is quite costly, but it is also worth your money. It is designed to last at least two years, with a warranty to back that up. It is also packed with options for controlling discharge, power absorption, battery status, nighttime work and more. You will probably never even use all the options that are built into it, but it is nice to know that they are there and available if you ever do need to do something a bit different. This controller is excellent at getting rid of heat, and it can dissipate heat quickly and effectively to protect the battery life. This inexpensive charge controller has been made to be easy to set up. Just about anyone can use it and make it work well for their smaller system. You do need to use this with a small system that’s low capacity and that won’t be used to supply a large structure or complex. It’s best used on RVs and in providing partial power to a home. 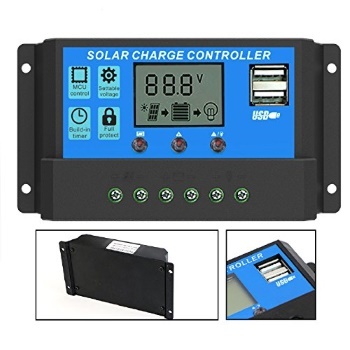 If you want to power and regulate a large solar power system, but you don’t want to pay for one of the more expensive brand name charge controllers, then this is the product for you. It is inexpensive, comparatively speaking, yet it can handle all the power of a high capacity system with ease. 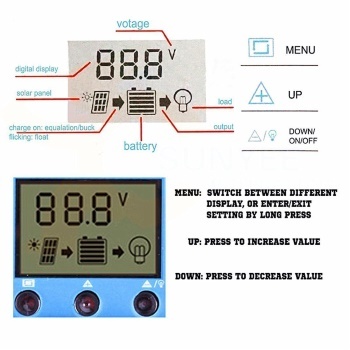 You can set your parameters how you like, and it’s fairly easy to use and to effectively regulate your battery usage with the LCD screen and other user-friendly features. This controller from Sunway is probably the easiest charge controller to use. It is designed to connect quickly and simply, without you having to worry about lining up positive and negative leads. It protects against overcharging in a few ways, keeping your system safe and operating at peak efficiency for a long time to come. 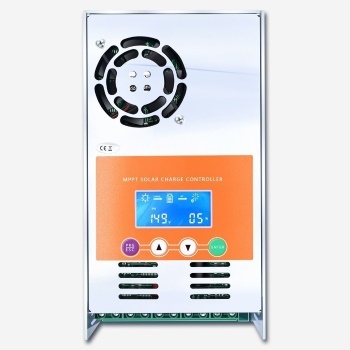 It’s made for smaller, low capacity system, so you will want to check to ensure that yours is under 80w for maximum operating efficiency and to ensure that your charge controller won’t burn out. ALLPOWERS has a decent but uneven track record. You can get some great products from them that tend to work well most of the time, but sometimes you get a charge controller that dies on you prematurely and doesn’t function the way it is supposed to. Most people are happy with this particular charge controller, but you will also find those that have a bad experience, and their charge controller gives out on them after a few months of use. This one is designed to take care of discharging on its own and to keep the system and battery from overheating and overcharging. It does well at that when it is working like it should, and it’s suitable to be used on smaller buildings, on RVs and to provide partial power. 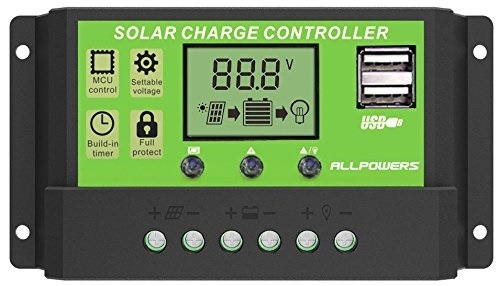 This is an inexpensive, reliable solar charge controller, and it works very well for areas where the solar charge is medium to high. If your system isn’t being taxed too much and you are not trying to draw a ton of power out of it, then this should work fine. 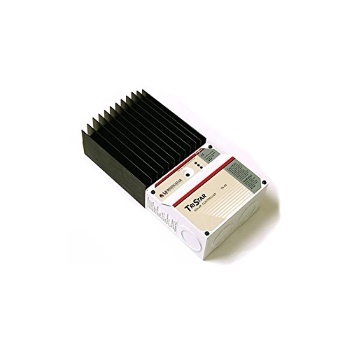 According to VictronEnergy.com, you can get all the power you need out of a PWM controller like this one and not have to worry about many issues. It will protect your system against a variety of issues, preventing overcharging and overheating for a low price. The only real issue with this controller is that it can get burnt out after a while, and it may not last as long as some of the other choices on this list, so just know that you are getting what you pay for. he solar charge controllers above were selected due to their decent price, their effectiveness and their durability. You will need to carefully consider which one you should use for your own solar power system to get the most out of it and to enjoy steady solar power. The most important thing would be to know your solar system, its requirements and the environment characteristics it is set up in. That way you can be confident you will be getting a solar charge controller that will meet your needs, and serve you well for a maximal period of time.